If you’re anything like me, you’re always on the go. Like an old fashioned record player that has the speed set too high for the song, our lives seem to be running at an ever faster pace. Things move by so quickly, we wake up, start our day, then next thing, we’re saying goodnight and we’re back in bed; where did the day go? It’s not this way for our horses. Their lives move at the same pace and always will. Clinician Tom Curtin likes to say, “I never heard of a Horse that could tell time, never saw one wear a watch or care about keeping a schedule.” With this sort of basic conflict between horses and humans, it’s no wonder we have problems communicating. The philosophy behind Training Through Feel what many know today as ‘Horse Whisperers’ or practitioners of ‘Natural Horsemanship’, has altered attitudes, turned the old standard ways of training on their ear and generally redefined the concept of horsemanship for hundreds of thousands of people around the world. What began fifty odd years ago as a personal journey for two brothers; Bill and Tom Dorrance, a couple of California cowboys who found a better way, has grown into a billion dollar industry. It’s made millionaires out of a few and created steady careers for many others. It used to be, not so many years ago in fact, that discovering and understanding this magical new training method took a lot of time, effort and in many cases pure luck. In the 1960’s for example, a person really needed to be in California, and preferably very close- as in the back pocket in fact, of one or both of the Dorrance brothers. Bill and Tom didn’t set out to change the world of horse training, nor did they have the intention of getting rich off of teaching their techniques. Both men lived humble lives and both simply got a lot of joy out of helping horses and people get along better. This is how Ray Hunt got his start. By chance, Ray met Tom Dorrance and they became friends; life long friends who developed a deep mutual respect for each other. Bill and Tom Dorrance were never ones to travel far, if a person wanted to learn from them they had to make the pilgrimage to California. It was Ray Hunt who pioneered, though trial and error, the concept of the clinic. Ray was the first to take what he’d learned from the Dorrance brothers about horsemanship and take it on the road. It was the early 1970’s, Ray had no idea at the time, but he singlehandedly started a revolution. Like an extended family tree, a person can trace the careers of nearly every senior clinician working today back to one or more of these three men. Pat Parelli, John Lyons, Buck Brannaman, Joe Wolter, Peter Campbell, Bryan Neubert, Tom Curtin, Martin Black, the list is a long one. Those early generation horseman, individuals who had the privilege to learn personally from Tom Dorrance, Bill Dorrance, Ray Hunt, or all three together, built upon and have passed their knowledge onto their students, who are currently passing their knowledge onto the latest generation; on and on it goes, like a stone dropped in a pond, the ripples extend outward at greater and greater distances. The internet has changed everything. In the “old days”, before every clinician had their own website, which for me was in the Spring of 1993, discovering training through feel came by word of mouth or pure luck. I happened to be attending a cutting horse event in Myakka City, Florida, when I came across a young woman sitting on an indian blanket selling hand tied rope halters. I had never seen a halter tied all in one piece like that. Especially one with a nice fat lead rope hooked on, so I bought one from the young lady for fifteen dollars and we began to visit. Her name was Trina Curtin. It turned out that she, her husband Tom and infant daughter Tana had recently moved back to Florida from Texas and were just beginning to set up a small ranch and horse training operation. From northern California, the revolution traveled slowly in those days. Here it was, the 1990’s and the Eastern US was just beginning to wake up to what was going on. 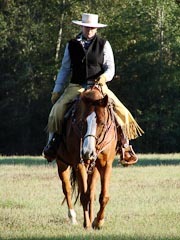 Trina and her husband Tom Curtin, took a colt I had in training and the experience altered my life with horses forever. The couple had first met Ray Hunt while working the big outfits in Texas. Tom and Trina would go on to develop a close relationship with Ray, inspiring Tom to build his own successful clinic career, one which gave me the opportunity to also learn personally from Ray Hunt. It was still trial and error, the process took time and a person had to be patient. We tied our own halters, tested out different weights of rope and experimented with various ways to build an effective ‘flagging tool’; a long stick made of flexible material with a piece of plastic tied to one end was most common. Now days, all a person has to do to be introduced to training through feel is punch in a bit of information on their computer. There are any number of successful clinicians marketing their ready-made “starter kits” through their websites. A week or so later, the box arrives and all of the necessary tools are inside along with professionally produced DVD instruction discs. It’s fast food horsemanship to be sure but I also believe it’s a great way to get started. My only advice is to not be devoted to one teacher- branch out. There are a number of excellent trainers out there who have valuable knowledge and wisdom to share. If there is one secret to getting all of this stuff to be effective it’s training yourself to work at the horse’s pace and not yours. When we pull up in front of the barn, time needs to stop, take off your watch, turn off your cell phone and devote your full attention to your horse. You’ll get a lot more done and you’ll feel a lot better too. Comments for "Fast Food Horsemanship"
Denise on March 07, 2011 Every day, I miss Ray. I only rode under him twice but each time, he spoke and it took me three years to catch up. Tom and Trina are Florida’s fabulous horsemanship resource. The dynamic duo represent the gold standard in horsemanship. Tracy, another great article. Your insight expresses what we FEEL, but cannot write. Sal Landa on March 07, 2011 Thank God for clinicians who are making it possible for the back yard horse owners to be able to communicate with their equine partners. These clinicians have come into our living rooms and changed our attitudes towards the horse. Tracy on April 08, 2011 Thank you Beth! And thanks also to the big “D” and Sal- I greatly appreciate your kind words. It’s been a long and often tedious path for many of us and I find it so refreshingly positive to see all of the helpful “short cuts” these days. Making this all easier and more accessible for folks potentially makes life better for a lot more horses out there- I think Ray would approve.